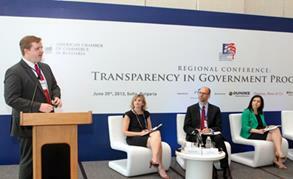 ITA’s Adam Boltik presents on public procurement best practices in Bulgaria. In recent years, U.S. companies doing business in Southeast Europe have sought assistance on issues related to certifications, lack of transparency in tender announcements, discriminatory time limitations and the use of dumping prices. As Southeast Europe stands to benefit from over 50 billion Euro (approximately $65 billion) in EU funding in the 2014-2020 cycle, government procurement will be a driving force for these economies. Eradicating corruption and guaranteeing fairness is in the vital interest of U.S. exporters competing for these opportunities, but for these countries, as well, since future economic development will depend on spending the resources wisely. I recently had the opportunity to accompany a Department of Commerce delegation that traveled to Southeast Europe to co-host a series of workshops on Transparency in Government Procurement. The International Trade Administration (ITA) partnered with the Athens Chamber of Commerce and Industry, the American Chamber of Commerce in Bulgaria, and Bulgaria’s Public Procurement Agency in organizing the workshops, which drew an audience of government officials and members of the business community from around Southeast Europe. The workshops, held in June in Athens, Greece and Sofia, Bulgaria, helped shine a light on obstacles to fair competition in government procurement in Southeast Europe and gave the U.S. Government the chance to engage with the governments of Greece, Bulgaria, Macedonia and Romania on this topic. Here at ITA, we take pride in promoting favorable business environments in foreign markets to level the playing field for American business. To support this effort, the workshops in Southeastern Europe focused on best practices in government procurement, and how the procurement processes of the United States federal government comply with international obligations. The Commerce team reached out to over 200 individuals from the public and private sectors. In Bulgaria, there was wide coverage of the event in 12 different print and electronic news outlets. The workshop series served as a platform for raising private sector concerns, from both a regional and U.S. company perspective, and it increased awareness of the rights to businesses and the obligations on public sector actors to ensure that U.S. exporters have the opportunities they deserve under the WTO’s GPA. Additionally, the information we gained in our discussions with foreign government officials and from U.S. exporters looking to be active in the Southeast Europe region will directly feed into our Transatlantic Trade and Investment Partnership negotiations as we look to provide even greater opportunities to compete on a fair playing field for U.S. companies. If you are interested in the information provided during the workshops, you can find the presentations on the American Chamber of Commerce in Bulgaria’s website. If your company has experienced a trade barrier, please use the Trade Compliance Center’s online complaint form to let us know so we can help.